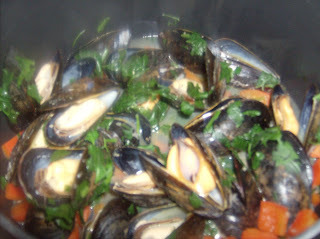 For my first attempt at making mussels I went for the classic Mussels a la Marinere, mussels in a nice wine sauce. So recently, I was walking around Eastern Market and I saw that they had fresh mussels for sale ($3.25/lb!) and I just had to buy them. What am I gonna do with them? No idea. I took my mussels home, deciding that I wanted to try something different, so I browse around and I find a recipe for "Mike's Drunk Mussels." Tequila, lime and mussels, sounds fabulous, right? I went to the grocery store and liquor store and made me some drunk mussels. Were they good??? They were alright. The mussels were normal, tasted like mussels. I like cilantro, so having boatloads of cilantro in there was nice...all the green in the photo is cilantro. The negative was that the sauce so was so alcoholic. The tequila only cooks for a few minutes with the mussels so it still has a lot of alcohol in it. After I dipped a few pieces of bread in the sauce I was practically drunk, each one was like taking a shot. Which is ok if that's what you're going for, but I wasn't. My favorite part of mussels is dipping bread in the sauce, so not being able to do that (without a hangover the next day) is a big negative for me. In short, this is a good alternative to the classic French style of mussels but I don't think it's something I'd make regularly, maybe with less tequila or with reducing the sauce a bit. Organics - do you or don't you?